A bold pairing of two full-flavor foods in perfect harmony. Did you know we're one of the only blue cheese producers to spike by hand? Meet our creamery manager, Nat! Part of a new series of employee profiles. Looking for a special way to celebrate the New Year? Our favorite pairings and tips for entertaining with cheese! We have a wild & crazy tasting batch of Bayley Hazen Blue. It's not typical, but it's delicious! Our team is at the Slow Food CHEESE festival in Bra, Italy. Read more about our time there! A closer look at how much we make of our different products. 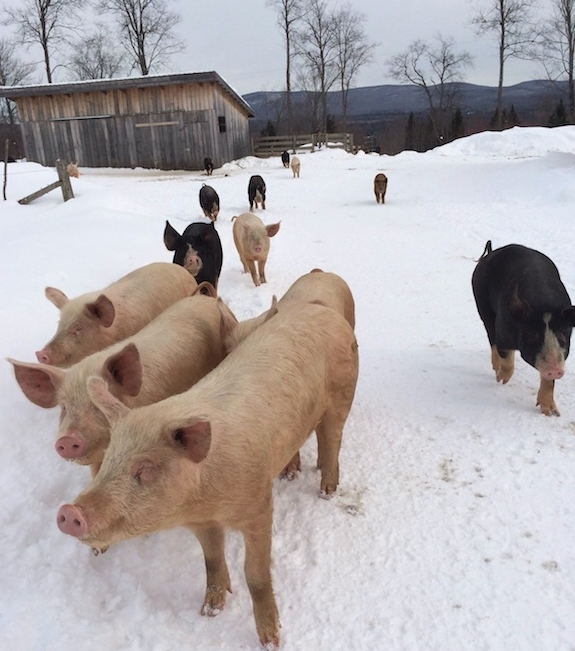 This week we're donating a portion of our sales to Heartbeet Lifesharing of Hardwick, VT. It's been a particularly warm & stunningly beautiful autumn! Did you know we have a microbiologist on staff? Europe is getting ready to stake a claim on their traditional cheese names. Lucky for us, our cheeses are already all named after local people & places! Another beautiful mural from Tara Goreau - in our creamery cell at the Vermont Food Venture Center! Meet Jenny, a very special lady.